Crowds gather for Family Day at Skilled Stadium to meet the Geelong “Cats” football stars after winning the Grand Final of the A.F.L. 2007. Total Events of Geelong teamed up with CLS Hire to erect this roof with PA and LED Screen wings. 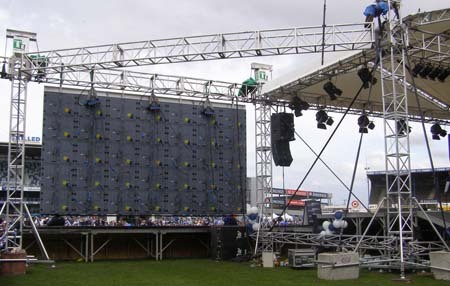 The LED screens weighed in at 1700Kg each and the PA an extra 600Kg. Strong winds and rain were no problem for this structure as it is designed to handle a once in 100 year wind event.